Discover animals, shapes and numbers! Press the plunger to hear fun spinning sound effects. Includes 7 songs and 20 melodies. 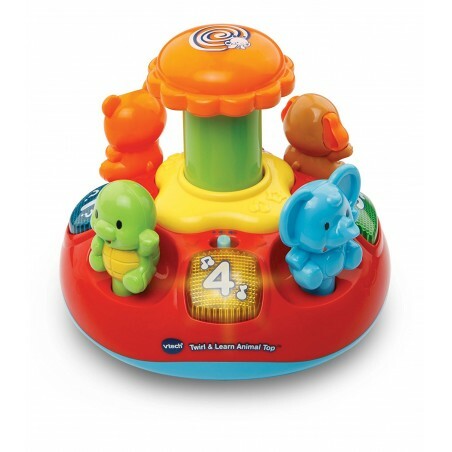 Spin and discover animals, sounds, shapes and numbers with the Push & Play Spinning Top! The press down plunger spins the animals round and round and helps your baby discover cause and effect relationships. Fun spinning sound effects play and will enhance audio stimulation. The four brightly coloured animals introduce themselves, their sounds and sing a song to baby. Pressing the four light-up shape buttons enhance visual stimulation and introduce shapes and numbers. Fun phrases, sounds and melodies encourage discovery and exploration. Includes 7 uplifting sing-along songs and 20 fun melodies. English speaking voice promotes recognition and accelerates learning.